Seven lesson modules have been compiled to expand students’ knowledge, to prepare the Scholars for a week at NASA Langley Research Center if accepted to attend a Summer Academy, and to familiarize them with NASA’s Earth System exploration. Learning will take place through weekly reading assignments, simulations, viewing video segments, and participating in online discussions. Learning will be demonstrated through completion of case study analyses, content-related math/physics problems, quizzes, APA written reports and a final capstone report. These module activities are submitted in sequential order every two weeks and posted through the VESSS online course website. All activities within the modules are reviewed and evaluated by a certified Virginia educator through the online system with detailed feedback provided. All VESSS modules are aligned to the following standards for students in grades 9-12. Scholars participate with VESSS staff, their instructors and each other in online discussions during the course. These online discussions focus on current technology that support NASA’s vision for space exploration. As part of the course assessment, scholars are expected to participate in these discussions. Students may receive up to five transferable college credits, at no cost to them, from Thomas Nelson Community College depending upon their successful completion of the online course and Summer Academy program. To receive credit for this course, you must first apply to Thomas Nelson Community College. Even if you have taken a college course or completed a dual enrollment course through another community college, you must apply to TNCC. You will need to submit one of the following scores: PSAT, SAT, ACT, or VPT. For you to match the requirement, your high school Math SOL Score may be used. Please reference the chart below. ● The VPT test can be taken at your local community college (This is free). ● You will need to place into English 111 or Math (MTE). ● Eng 111 placement will qualify your score for English/Writing, Reading and Reading/Writing. ● MTE 1 qualifies as your mathematics score. Once you have applied to TNCC and submitted your registration form (This is provided on the VESSS Online Course Website), you must maintain a “C” or higher in the course to earn transferable credit. For information on Virginia Math Placement Testing, click here. For more information on TNCC’s Dual Enrollment, click here. For more information on Dual Enrollment test score requirements, click here. For more information on the Virginia Placement Test, click here. For the Thomas Nelson Community College handbook, click here. If selected students participate in the distance learning coursework and complete the Summer Academy program, school districts will be encouraged to grant a science elective credit towards graduation. The final decision regarding any credit rests with the student’s school system. This Geology 195 course falls under the guidelines of Virginia as an Earth Science Level II course. According to the State of Virginia, if a student has not taken Earth Science Level 1, the student will have to take the Earth Science End of Course SOL. The information provided throughout the modules in the VESSS course will more than adequately prepare the student for this End of Course SOL for Earth Science. Unless the student needs this credit for graduation, the results of the SOL score will have no bearing on academic ranking or graduation. Students are put into groups of four mission teams: the Biosphere, the Hydrosphere, the Atmosphere, and the Lithosphere. Each team will collaboratively design a feasible mission to study the Earth Systems and the effects on climate variability. At the end of the week they present details of their mission to NASA scientists, engineers, and technologists during a Mission Design Review Panel and then to NASA administrators, state legislators, parents, and other VIPs at the Closing Ceremony. Scholars will tour different facilities and labs that are typically not accessible to the public to view projects and technologies that currently support space exploration programs. Scholars have the opportunity to observe a vast array of careers in the areas of math, science, engineering, and technology. They will receive seminar presentations from NASA scientists, engineers technologists, astronauts and Earth Systems Science industry representatives. 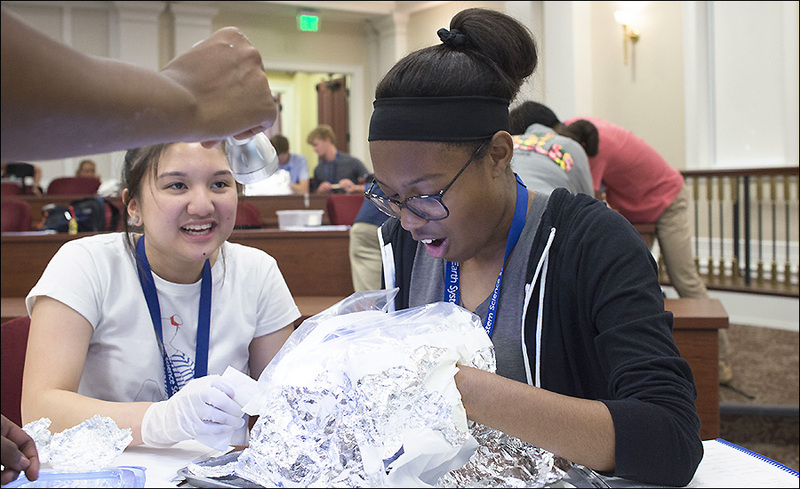 During the Summer Academy, NASA scientists, engineers and other NASA personnel will mentor each of the four teams. The NASA Mentors work directly with the students several hours each day to offer guidance, advice, and knowledge to help the scholars successfully complete their mission designs. The scholars learn from the mentors how to work effectively on a project team when given a budget with specific parameters and tight benchmarks and deadlines to meet. The mentors also share their background and working experiences with the scholars.